A dying art a century ago, bagpipe playing was revived in large part by Irish Immigrants in the New World who wanted to preserve their culture. Many of the guys were cops. For instance, Francis O’Neil, Chicago Police Chief from 1901 to 1905 organized an “Irish Music Club” that sparked renewed interest in the bagpipes. When cops wanted to salute their fallen brethren they thought quite naturally of the pipes, which had been played at funerals for hundreds of years. A big promoter of this practice over the past half century has been the Emerald Society, an Irish fraternal organization found at many police departments. Many chapters sponsor pipe and drum bands. Being practical folk. cops use the Scottish version of the bagpipes, which are louder and better suited to outdoor use than the Irish counterpart. The tradition of bagpipes played at fire department and police department funerals in the United States goes back over one hundred and fifty years. When the Irish and Scottish immigrated to this country, they brought many of their traditions with them. One of these was the bagpipe, often played at Celtic weddings, funerals and ceilis (dances). It wasn’t until the great potato famine and massive Irish immigration to the East Coast of the United States that the tradition of the pipes really took hold in the fire department. In the 1800’s, Irish immigrants faced massive discrimination. Factories and shops had signs reading “NINA” - No Irish Need Apply. The only jobs that they could get were the ones no one else wanted - jobs that were dirty, dangerous or both - firefighters and police officers. It was not an uncommon event to have several firefighters killed at a working fire. The Irish firefighters’ funerals were typical of all Irish funerals - the pipes were played. It was somehow okay for a hardened firefighter to cry at the sound of pipes when his dignity would not let him weep for a fallen comrade. Those who have been to funerals when bagpipes play, know how haunting and mournful the sound of the pipes can be. Before too long, families and friends of non-Irish firefighters began asking for the piper to play for these fallen heroes. The pipes add a special air and dignity to the solemn occasion. 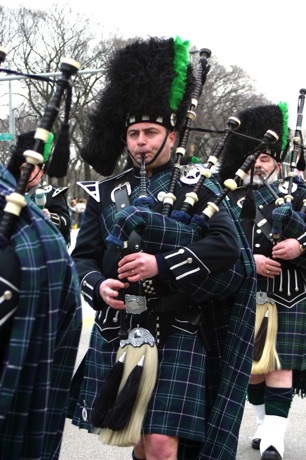 Associated with cities such as Boston, New York, Philadelphia and Chicago, pipe bands representing both fire and police often have more than sixty uniformed playing members. They are also traditionally known as Emerald Societies after Ireland, the Emerald Isle. Many bands wear traditional Scottish dress while others wear the simpler Irish uniform. All members wear the kilt and tunic, whether it is a Scottish clan tartan or Irish single color kilt. Today, the tradition is universal and not just for the Irish or Scottish. The pipes have come to be a distinguishing feature of a fallen hero’s funeral.